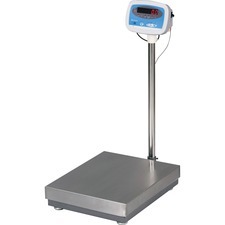 Electromechanical digital bench scale is designed for greater accuracy up to a 100 lb. capacity. Weight Hold Key locks the weight reading when a large package blocks the display. Key functions include Hold, Tare, Units (pounds or kilograms), and Zero/On-Off. Scale operates via the included AC adapter or 9V battery (not included) and features overload protection and auto zero tracking. Internal backlit display offers 1" high LCD digits for easy visibility. Scale automatically shuts down after four minutes of nonuse to save on battery or electricity. Switch keyboard technology ensures reliability and longevity. Handy scale is portable with an attached handle. 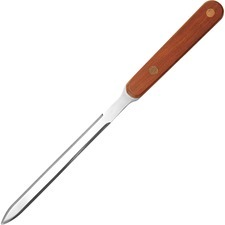 Sturdy design includes 22-gauge steel with a ribbed base. Platform size is 12" x 10". Floor scale features a high-quality indicator and platform combination. Indicator can be column-mounted or bench-mounted. Standard features include 1" LED display, programmable backlight and weighs in pounds and kilograms. Programmable features include checkweighing, counting, and totaling. 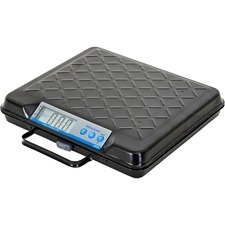 Scale offers internal rechargeable batteries, stainless steel platter and base-mounted carry handle. Capacity is 300 lb. Platform size is 22" x 18". Column height is 25-3/4". 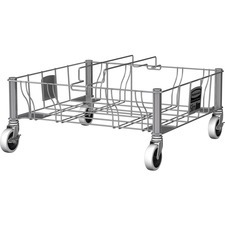 Rubbermaid Commercial Stainless Steel Double Dolly - 200 lb Capacity - 4 Casters - 3" Caster Size - 20" Length x 20.6" Width x 9" Height - Stainless Steel Frame - Stainless Steel Collect and transport waste and recyclables with this stainless steel dolly for Slim Jim containers. It is made of quality stainless steel that is easy to clean and won't rust or chip in moist environments. 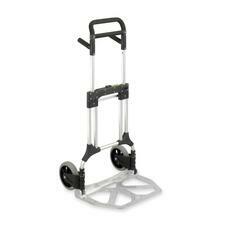 Its 3" nonmarking, quiet casters allow smooth and quiet maneuverability. Locking feature on casters creates a stable recycling station or collection site. Dolly accommodates both 16 and 23 gallon Vented Slim Jim Containers from Rubbermaid Commercial. Weight capacity is 200 lb. (91 kg.). LeakSeal Brush features an easy-to-use formula that creates a flexible rubber coating to fill and seal leaks and cracks instantly. Watertight seal prevents moisture penetration, rust and corrosion to ensure your surfaces are completely protected. Plus, it dries to a paintable finish for discreet use virtually anywhere. LeakSeal Brush is perfect for gutters, roofs, flashing, ductwork, PVC, masonry, concrete and more. Swingline® Finger Tips are constructed of high grade rubber and feature extra thick material at tip to provide maximum durability. The nubbed surface ensures better gripping. Amber in color; multiple sizes available to guarantee a close fit. Compact, accurate digital postal scale will save you trips to the Post Office or mailroom and keep you from spending more than necessary on postage. Weigh envelopes and small packages up to 5 lb. on the 5-9/10" x 5-9/10" (15cm x 15cm) platform. The LCD screen displays the weight in an easy-to-read digital format in lb./oz. (0 lb. 00.00 oz.) or kg./g. (0 kg 000g). The convenient "hold" feature continues to display the weight for 10 seconds after you remove the envelope or package. Ideal for weighing larger items that block your view of the display. The tare function lets you weigh items in a container without including the container weight. The automatic shutoff feature conserves batteries when the scale is not in use. 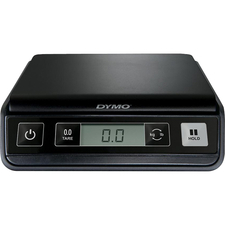 Compact design allows the digital postal scale to fit on the busiest desk and store neatly in most desk drawers. Postal scale runs on three AAA batteries (included). Safco Stow-Away Heavy-duty Hand Truck - Telescopic Handle - 500 lb Capacity - 8" Caster Size - Aluminum - 23" Width x 24" Depth x 50" Height - Aluminum Frame - Aluminum Versatile, collapsible hand truck fit neatly into small spaces for compact storage. Lightweight aluminum frame for easy transport. The 500 lb. capacity is suitable for most office use. Collapsible hand truck features include, 8" diameter solid rubber tires, a 23" wide x 16" deep toe plate, and telescoping handles that tuck away for storage. Printable postage stamp labels are U.S. Postal Service-approved stamp-ready. Print popular mail classes including First Class (1 to 13 oz. ), Priority Mail, Express Mail, First Class Mail International (1 oz.) and additional 1 cent postage stamps for rate increases. Stamps are compatible with laser and inkjet printers. Use printable postage on a PC or Mac with an Internet connection.